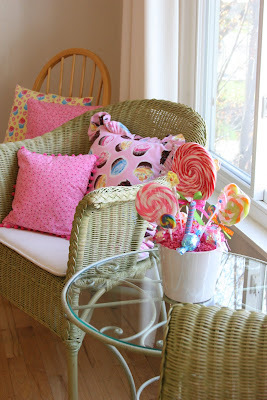 This is post 3 of 3 on the candy themed birthday party I put together for my daughter’s 6th birthday. The two previous posts show some of my planning and pre-party preparations, post 1 (here) shows the invitations and favor bags, post 2 (here) includes some of the games, prizes and decorations. 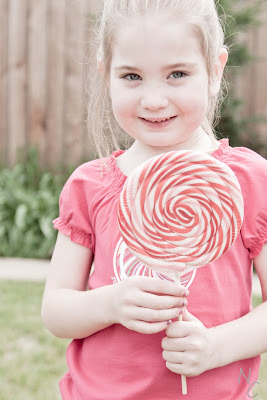 About six months ago I decided I would love to do a candy themed birthday party for my oldest daughters next birthday. 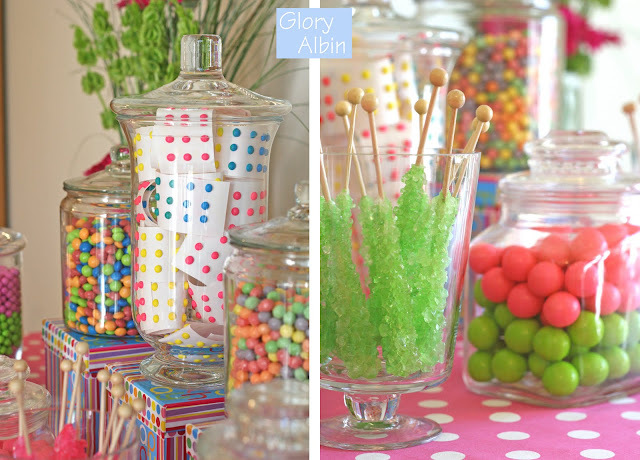 I began collecting pretty jars that I would use for the candy buffet, I decided on the color scheme, and began scouring the internet and all of my local stores for anything candy related… ideas, decorations, invitations, etc. I really enjoyed every step of the planning and preparation (except the cleaning my house part! ), but I am also a bit glad to say… it’s over! The party was held this weekend, and I think I can safely say it was a success. We had 23 children and 16 adults in all… did I mention the party was at our house, oh and that our house is under 1500 square feet? Needless to say we were very thankful to have beautiful sunny weather so that we could make use of our backyard for all of the games. In the end, all of the children headed home with smiles… I hope that was because they had fun and not just from all the sugar… but either way, they were smiling! 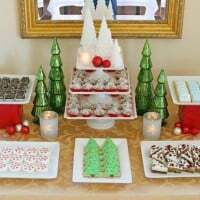 The candy buffet was one of my favorite things to plan, and set up. (Inspired of course, by the amazing work of Amy Atlas) See this post for the sources of the jars. I bought a lot of the candy from OhNuts.com, and the banner and flower arrangements were made by me. 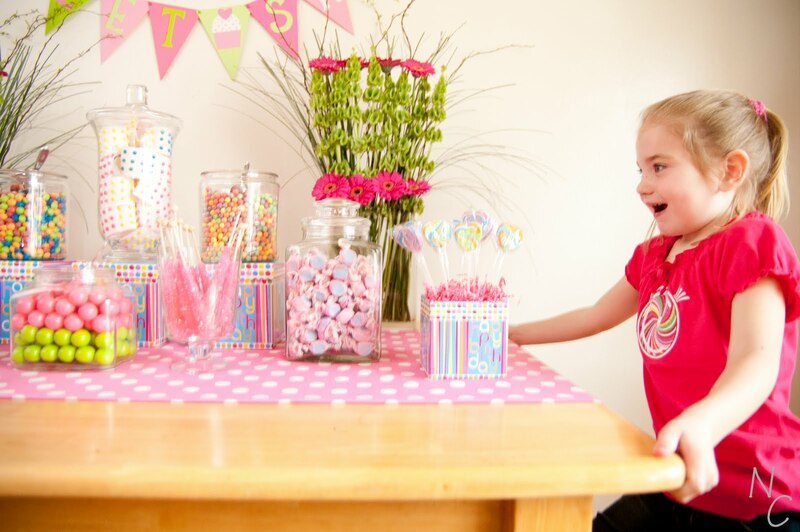 Here is our sweet birthday girl admiring the candy table. The food and dessert table included a small cake, lots of cupcakes (with cookie toppers), cookies (in the shape of candy), as well as some pinwheel sandwiches and fresh fruit. All of the food was made by me. 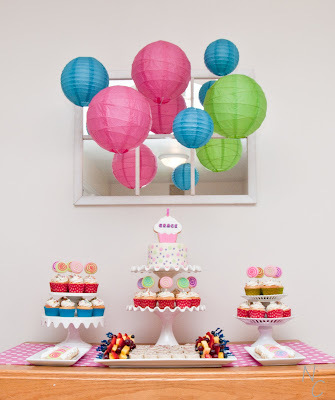 I accented the table with paper lanterns from Luna bazaar. 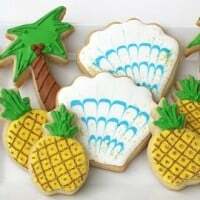 Below is a close up of some of the cookies I made. There were lollipop shapes (that I used as cupcake toppers), cupcake shapes and candy shapes. 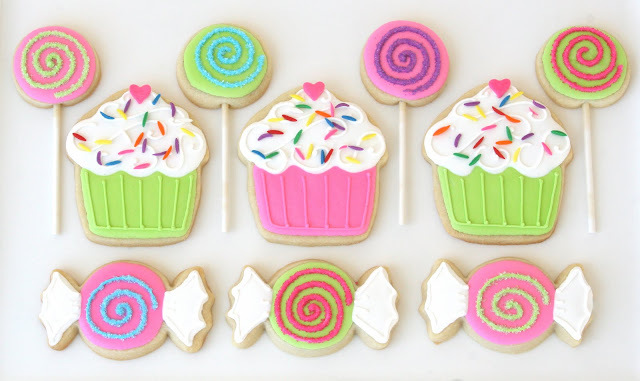 I’ve shared the sugar cookie recipe I use HERE, and all the how-to’s for the lollipop cookies are HERE. 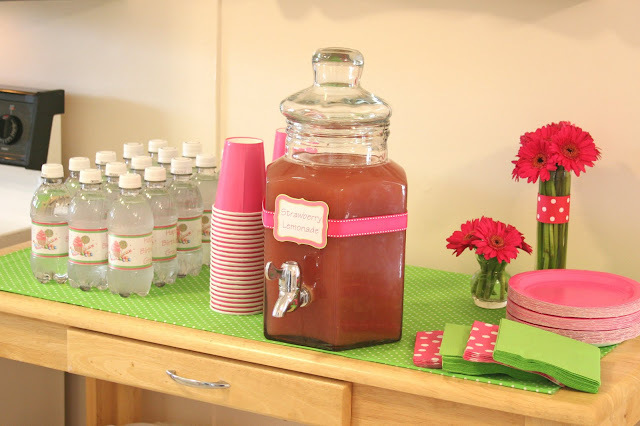 We served strawberry lemonade to drink, as well as water bottles with custom labels that I designed and attached. How-to’s for making your own custom water bottle labels HERE. Inside the house I had several of the pillows I showed you in this post, and I also made several arrangements of various sizes of lollipops (that I’ve been collecting over the past several months from a variety of stores, including Target, Wal-Mart and Party City). Below are a few more of the decorations, including a sign I made for the front door and lollipop decorations I added along the front walkway (how-to’s HERE). Below you can also see a game my husband constructed for a bean bag toss game (my mom made a set of bean bags using the same cupcake and sprinkle fabrics she made the pillow covers with). And we also had a jar of jelly bellies to guess the number of. 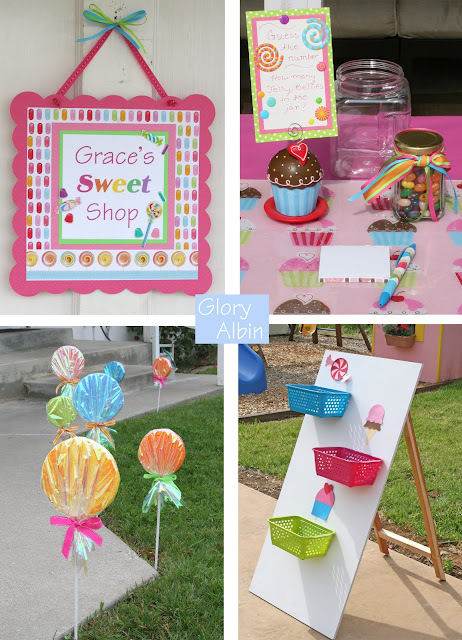 Other games included a version of musical chairs using the songs Lollipop, Sugar and The Candy Man and a bingo game I created using images of sweets in place of numbers (you can see it in this post). Our other sweet pea, Joy. Some shots of mommy (me), daddy and Grace on her special day. One of the best decisions I made when planning the party was to realize it would be near impossible (and very stressful) to be trying to photograph the party and host it at the same time. I asked a photographer friend if he would come take photos during the party, and he agreed. What a gift I gave myself! 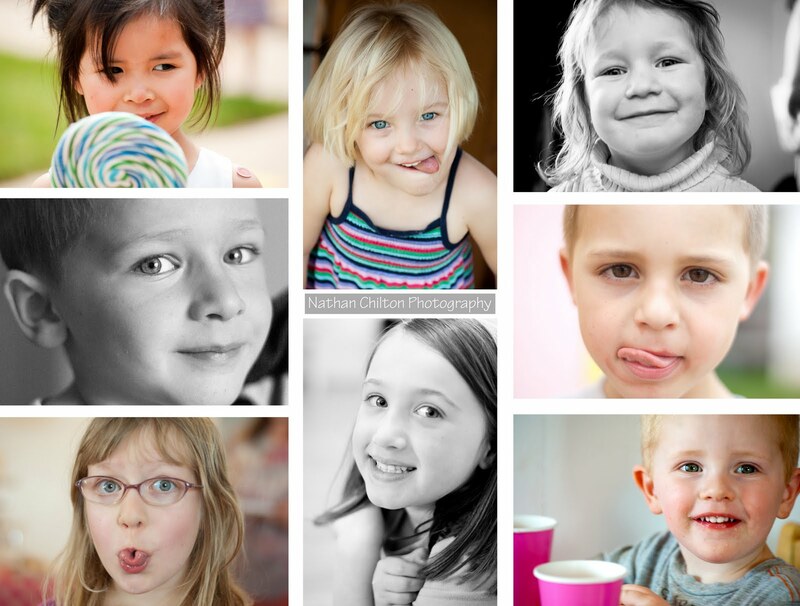 He did such a beautiful job capturing the smiling faces… I may never try to photograph my own parties again! Any photos in this post marked with a NC in the corner are from the very talented Nathan Chilton. 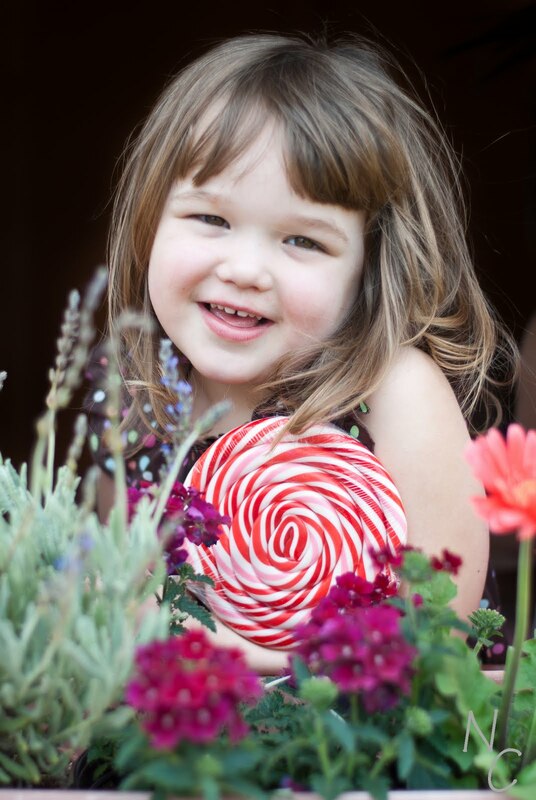 In fact, one of my goals when planning this party was to get at least one gorgeous shot of Grace (ideally holding a lollipop). When I first saw the photo above, I knew the party was finally complete. Thank you Nathan! All other photos by me (Glory Albin). Glory, I just found your blog today. I don't post often but I couldn't allow myself not to after seeing your work. I believe my standards are very high …and your work is phenomenal! Your attention to detail, your precision, and your commitment to excellence makes your work pop. What a great artistic eye you possess! Thank you for all you do. It inspires us! Glory, I love that your ideas are ones that I can duplicate yet are so very cute. About the water bottles… how well do you think your home-made labels with the packing tape would last if the bottles were perched in a beverage bucket? I don't have enough time to experiment with a prototype. Did they fall off with condensation or were they pretty hardy? 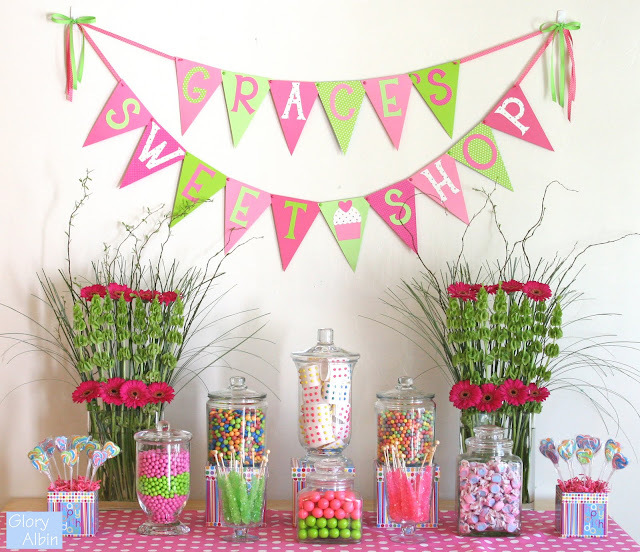 LOVE, LOVE, LOVE what you did for Grace's party! Can you tell me how you made the bunting hanging behind the treat table? WOW – your site and your work are absolutely amazing! so inspirational and pretty to look at!! 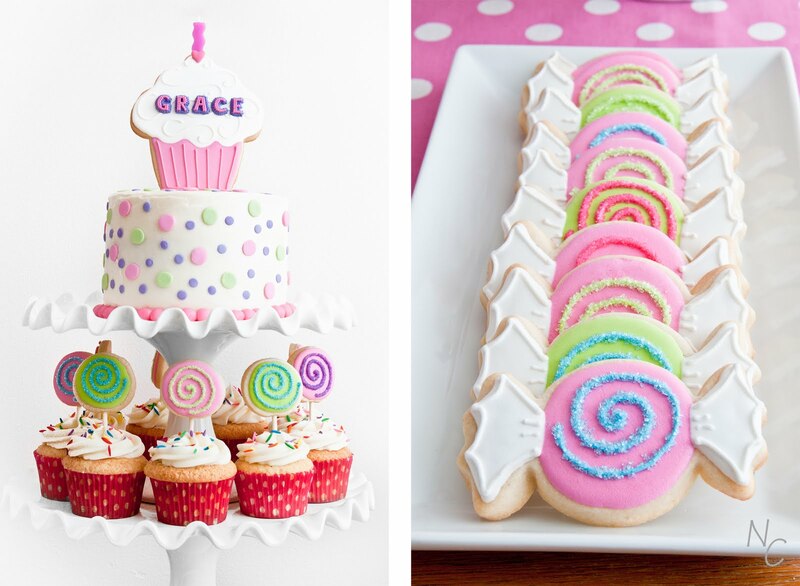 love love love the pretty themed candy birthday celebration for Grace. Agree – photographer friends are such a HANDY thing. I am in love with your ideas and amazing talent. I would love to try this candy theme for my daughter's 6th birthday in March. Is there any chance you can walk me through how to do the cookies? I don't understand quite how to get the sanding sugar on just the swirls in the lollipop cupcake toppers while not getting it all over the rest of the cookie. I'd love a little help with the candy and cupcake shaped cookies too. Thanks! I have never felt so jealous of a 6 year old in my entire life. I want that birthday party too! This year! MAN you put a lot of work into that, and it is completely awesome! Seriously…. my jaw is on the floor! Just perfect! Shared in my blog http://www.fazendoaminhafesta.blogspot.com! Thanks! I admire you so much, everything you share on here is stunningly, perfectly, amazing! So so so inspiring, thank you. Grace’s party looks absolutely beautiful! Can you tell me how you made the flower arrangement? A friend of mine is inspired by the beautiful layout you created and I’ve offered to contribute by making the arrangement. Wow! I just saw this post. This is lovely! What was the game with the baskets on the board? I am throwing a 4 yr old bday party. What a great find in your blog. Wahoo thanks. Take ALL the ideas you can give me. 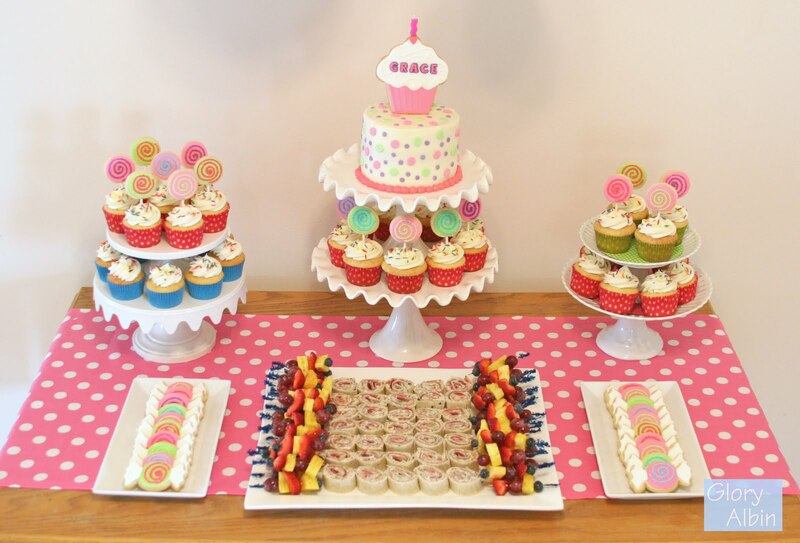 This is a dream birthday party for any little girl! So beautiful – clearly, there is a lot of love and talent that went into the making of it. 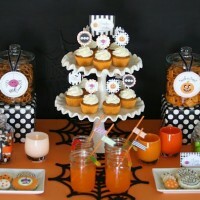 I love the picture of your daughter as she looks at the candy table! That is a priceless reaction! OMG! 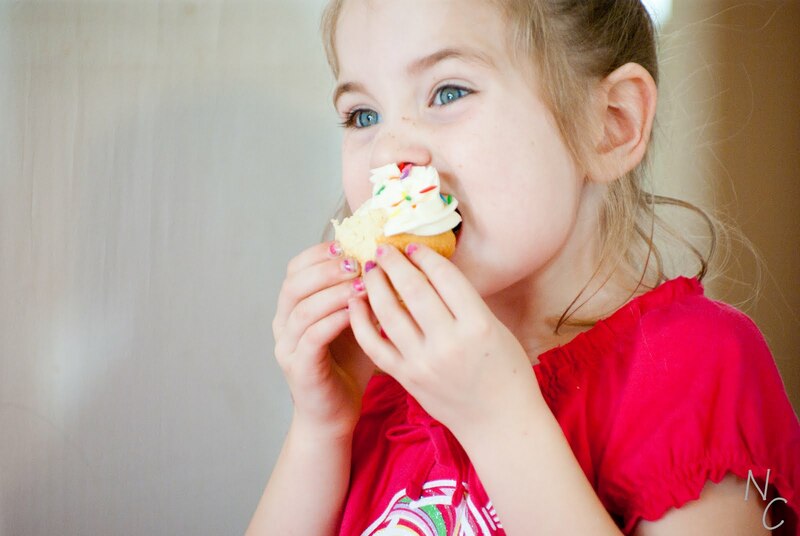 Grace is so cute when she’s eating that cupcake! Oh this is such a nice party! I know she will never forget it! I saved every single image from this webpage. Tell her happy birthday for me. Oh My Goodness, Glory, you are supremely talented. Loved looking at the fabulous things you do. So glad I found you.